The Holt High school North campus building on Feb. 10, 2017. In March it will be three years since the seniors switched from the main campus building across the street to this building. 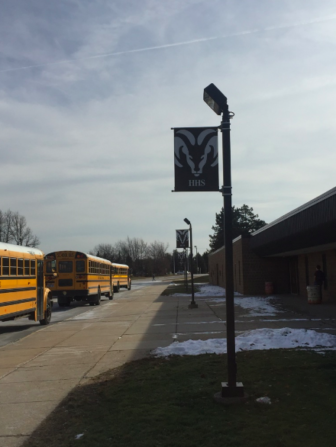 Buses lined up outside of Holt High School’s senior campus on Feb. 10. Photo by Claire Barkholz. On Jan. 26 a Holt High School student was removed from a district school bus after confronting the driver about allowing bullying on the bus. In this circumstance the bus driver did not allegedly help stop the bullying situation, which has a lot of parents questioning how the school handles bullying situations when they arise. “The bottom line is that the driver allowed this to go on and did nothing to stop it and instead retaliated against my daughter,” said Hill. Relating to the bullying on the bus incident, administrators continue to evaluate “appropriate actions” for all parties involved. That could include discipline for the students doing the bullying and the bus driver. 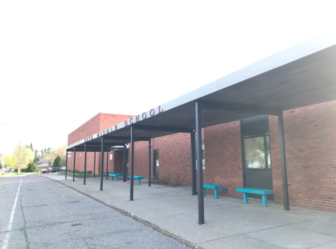 This bullying incident in the Holt Public Schools shows that there is a difference in opinion on how well the parents feel the school handles the topic of bullying compared to how the school feels they handle the topic. With bullying being a prominent issue in school systems since the beginning of time, Holt administrators and teachers are aware of it and feel they are taking precautions in order to try and help prevent it. 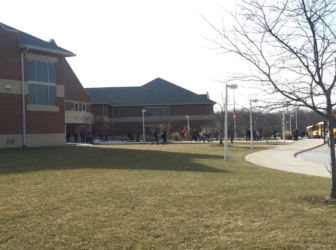 Students walk out of Holt High School at the end of the day on Feb. 10. Photo by Claire Barkholz. Holt High School senior, Syri Ammon says she has a hard time deciphering when friends teasing their friends actually turns into bullying. “I think the physical aspect of bullying like pushing people around and fighting or yelling and swearing at each other is dealt with very well by our police officers and principles,” said Ammon. 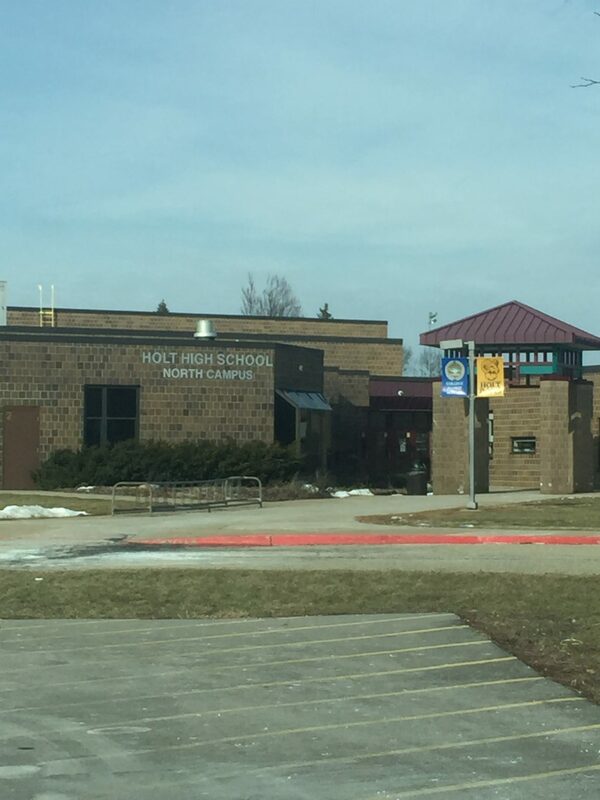 Holt public schools has practices set in place to try and reduce the amount of bullying that goes on, while also putting it on the radar of not only the students but the administrative staff. According to Florida Gulf Coast University Professor of Counseling, Russell A. Sabella, there seems to be a peak in bullying around the age of kids in middle school. Hope Middle School, which is apart of the Holt Public Schools, on Apr. 18. Photo by Claire Barkholz. According to Perkins, Holt Public Schools has nearly 1000 seventh and eighth grade students, which is a larger population than some entire school districts within the area. The way that people bully has changed drastically within the last two decades because of the new technologies created. Cyber-bullying, which can be done over cell phones, has become a major way that kids bully each other this day in age. Graphic by Claire Barkholz. According to Perkins a majority of student bullying seen in the Holt schools has been through cyber-bullying as well. Despite all the programs that school districts set in place to help prevent bullying from happen, the real question is will bullying in schools ever come to an end? Adults may need to set the example for kids, but kids are not oblivious to the fact that they can be the change that needs to happen as well.